Inspired by @spaceplasma’s solar system gifs I have had a go at a few of my own (completely ripped them off) for a few of solar system objects that were missed out; the dwarf planets Pluto & Ceres. Thanks to @spaceplasma for pointing me in the direction of the right font and embarrassing errors in the planet profiles. invented the Pluto?!? Whaaaaaat?!?! like all planets and dwarf planets, it was formed when the rock with the most mass, there for having the strongest gravitational pull, attracted another asteroid/rock adding to its mass and repeating this till it became Pluto. Wow though this is why people are on the Internet you’re good on planets dude but you need to learn about GRAMMER!!! Wow though this is why people are on the Internet you’re good on planets dude but you need to learn about GRAMMER!!! Just wow……..
Hi! Isn’t this site really cool? I don’t think Pluto is a dwarf planet because it goes around the sun in a oval shape like a comet and dwarf planets go where ever they want and pluto doesn’t. Its to small to be a regular planet. 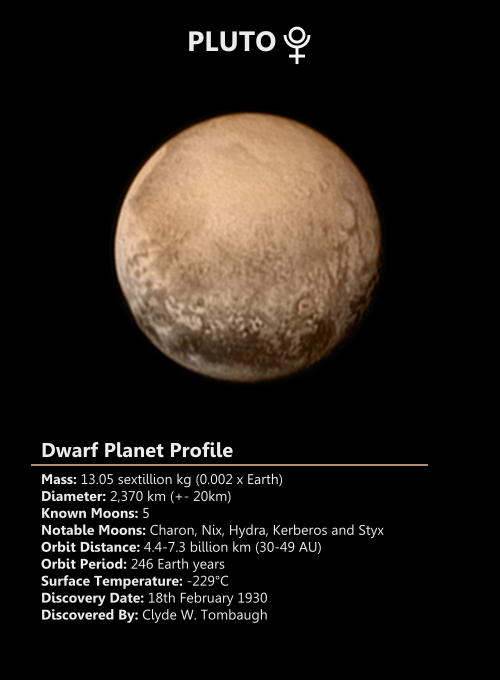 Its totally a dwarf planet. it does have irregular orbit. it switches places with neptune every 40 years and will collide many years later. are these three people the same person? I agree, but I don’t think you should make fun of Pluto. It was named after a Roman god. Give some respect! Isaac pluto is not a planet or a dwarf planet. Pluto has been a dwarf planet since 2006, it has an irregular orbit that makes it switch with Neptune every forty years. Its also pretty small. BIBBIB! Light blue, dark blue but it isn’t blue! Than what is it? Yellow? Hmm?!? It is not a bird, it is a small bird! Houston we have a problem. Scientists say it isn’t a planet. But why is than called the dwarf planet if it isn’t a planet? It should be called differently! Not planet and not dwarf planet. Or we can say IT IS a planet but it is a dwarf planet 😀 (imho) BIBBIB! Gif Ceres Pluto Charon nix hydra styx kerberos is that right. Ceres is on there twice. Pluto Is the Roman god name, while the Greek name for this god is Hades, Lord of the Underworld. Uranus is the father of Saturn (AKA Cronus), he is the father of Jupiter (AKA Zeus), Neptune (AKA Poseidon), and Pluto (AKA Hades). Jupiter killed his father, Saturn, and took control of everything. Also, another interesting fact, Saturday is named after Saturn, Saturns’ day. Pluto and Mars are the rulling planets of the zodiac sign “Scorpio”, Pluto and mars rock!!!! Pluto is associated with Death and Transformation. When Pluto comes back around to Earth on its rotation around the Sun, Iam gonna jump to it, “One small step for man, One giant leap for me”. Take care people.